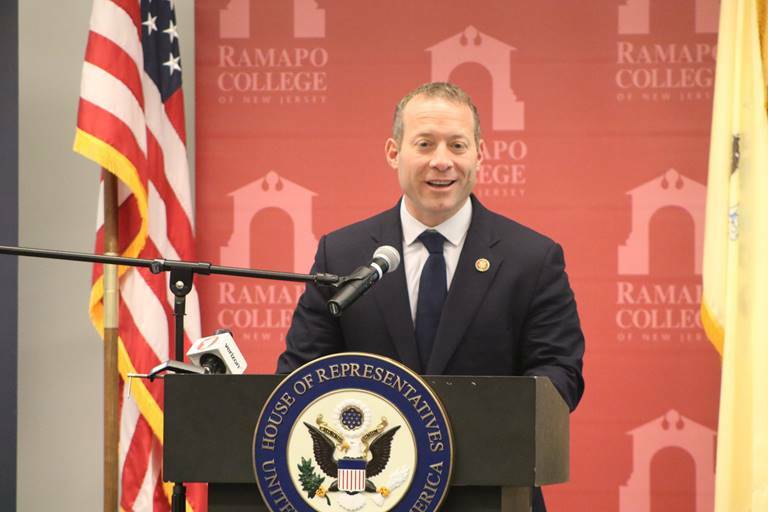 MAHWAH, N.J. -- Today, Congressman Gottheimer reported on the State of the District at Ramapo College. In his remarks, he outlined his clear vision for the future of New Jersey education, and the economy and he discussed his work for common sense solutions during his first term. Gottheimer identified high taxes, crumbling infrastructure, and red tape as obstacles that need urgent attention. Gottheimer’s vision for a stronger economic future included federal solutions like reinstating the SALT deduction and funding the Gateway Project and local solutions like increased coordination among private sector employers and community colleges and universities. “As I enter my second term in Congress, I think it’s important to take stock of our district and state, to review our challenges and opportunities, and to chart a course for a stronger New Jersey. Today, I’m going to talk about how, working together, across party lines, we capitalize on our strengths to grow and succeed, to fight even more for what our state deserves and pays for, what we could be doing even better, and how we must invest in our communities in the years ahead,” said Congressman Josh Gottheimer (NJ-5). As I enter my second term in Congress, I think it’s important to take stock of our District and state, to review our challenges and opportunities, and to chart a course for a stronger New Jersey. Today, I’m going to talk about how, working together, across party lines, we capitalize on our strengths to grow and succeed, to fight even more for what our state deserves and pays for, what we could be doing even better, and how we must invest in our communities in the years ahead. In my first term, I saw up-close what I always knew: it’s hard to beat Jersey. We have so much going for us. We have incredible schools, successful businesses and job creators of all sizes with some of the smartest, best-trained workers in the world … we have safe and beautiful communities … some of the fastest broadband in America … we’re only miles from New York City and breath-taking beaches … we have remarkably dedicated first responders, mayors, veterans, religious, and civic leaders – and, of course, the best bagels and pizza in America. The question is how can capitalize on these great assets, to help us compete and succeed, not just in the short term, but in the years to come. After all, we have one ingredient nobody else has: we’re from New Jersey and we share Jersey Values. That means we know how to be smart, tough, and gritty – and we get each other’s backs, to celebrate our achievements and to help when we are down. I think back and how the community came together last year after we lost ten-year-old Miranda Vargas from Paramus in a tragic bus accident. Her father, Joevanny, has handled the accident with incredible grace. To honor his daughter's legacy with concrete action, he and I have worked on Miranda’s Law, which will require automatic notifications of driver violations to school districts and school bus companies within 24 hours. We are also working to put lap-and-shoulder seat belts on all school buses in America. Working together, and thanks to the leadership of Assemblywoman Swain and Assemblyman Tully and others, we’ve already gotten state legislation signed into law. The bottom line: When tragedy struck, we didn’t look around and identify as Republican and Democrat. No, we looked at the American flag and saw stars and stripes – not red or blue. The key is not to fight with each other but to work together. As Lincoln said, “A house divided against itself cannot stand.” Public servants can accomplish the unimaginable when they are reminded that they are not elected to serve some national political agenda, but to help their constituents. That’s what happens every day at your kitchen tables, on factory floors, and in board rooms across our district. It’s what I learned when I was in business, and what I’ve heard from businesses of all sizes. They just want to grow and prosper and create more jobs and opportunity, and they’ve had it with the screaming and the gridlock. It’s what I’ve learned from holding more than 33 “Cup of Joe with Josh” Town Halls with people from every corner of the District. They just want us to figure it out, and to recognize that making progress is more important than getting everything you want. It’s what I did when I went to Washington and in my first term wrote laws to upgrade our rail safety data infrastructure and to help post-9/11 veterans get the care they deserve at the VA. I’m proud to have helped Alementary, a Hackensack craft brewery, get the permits they needed to expand their business after the shutdown cost them thousands and hurt their employees. I was honored to work with the community in Oakland to rename the Post office there after Frank Leone, a World War II veteran. I will never forget sitting with Jimmy Drake after he lost his son to a ISIS-inspired Lone Wolf Terrorist and deciding that, together, we would work on legislation, name after his son, Darren, to prevent future terrorist attacks. And I’m doing the same to fight terror and hatred, aimed at any groups and at our key allies including Israel. It’s all about coming together and doing right by others. People do it every day without any fanfare, including the scores of Hometown Heroes I’ve had the honor to recognize. And it’s what so many of our mayors and councils do, not to mention our state representatives and local officials. Most of them just want to figure it out -- to help their residents, to provide the best services, ensure our first responders, veterans, seniors and families have what they need, and keep costs and taxes down. I’m very proud of the work we’ve done together these last two years, whether it’s been working to keep our drinking water free of lead, fix a road, keep polluters out of our towns, help get prepared for a storm, or get essential equipment for our first responders. Together, we have fought to claw back more of our federal tax dollars back from the federal government. We’re up 16% from what we’ve historically received in Northern New Jersey -- to help cut our property taxes and fight back against the Moochers States. We can learn from that spirit in Washington. Right now, as you know, we have a divided government – a Democratic House and a Republican Senate and White House -- and real issues to tackle that can’t wait another two or four or eight years to resolve. The only way we’ll get there is by working, together, across party lines. When we first proposed bipartisan rules reforms, called “Break the Gridlock,” last year, to allow for more constructive, bipartisan governing, there was some resistance, particularly from the extremes, to these common sense reform. But we didn’t back down. Not only did the Break the Gridlock reforms pass, but it enjoyed bipartisan support, a feat unseen in nearly two decades, and it will allow me to work for what’s best for us -- to reinstate SALT, help get health care premiums down, and fix our infrastructure. Last Congress, the Problem Solvers Caucus, which I Co-Chair, nearly fifty Democrats and Republicans, came together and made bipartisan progress on issues others insisted we be impossible: school and gun safety, health care, criminal justice reform, immigration, and infrastructure. Congress must be able to sit down at the table and have real policy discussions. Otherwise, we will continue to end up with more outrageous behavior like the recent 35-day shutdown, the longest in U.S. history, that cost the economy $11 billion. It’s going to take us all working together to build on the incredible assets we have and stop the bleeding here in Jersey. Despite our many assets and successes, New Jersey is now facing clear obstacles -- both of our own and other’s making -- that need our urgent attention. And we’ll need to make tough, strategic choices if we plan on overcoming them. Here are some facts: people, businesses, and jobs are leaving our state faster than they are coming. Between the federal tax hike bill, which gutted SALT, and state tax increases, plus reams of red tape, and crumbling infrastructure, business owners are coming to me and saying the same thing: We love it here, I was raised here, but we just can’t afford it anymore. Those who aren’t leaving now, are considering it or are expanding in other places. This just doesn’t make sense given our historic assets. We led the world in life sciences before there was even a life sciences sector … we have the fastest broadband infrastructure in America … and we have some of the best colleges and brightest, hard-working people, and top-notch labor, in the country … and we are just miles from New York City. I will be doing my part to fight in Congress, but if we don’t act collectively, the New Jersey we all love, won’t be able to compete with other states. If you look at the stats, at our state budget, at our crushing tax burden, at our physical infrastructure, at our outflow of jobs and businesses, we should all be sounding the red alarm. The five- and ten-year outlook isn’t rosy. First, as I mentioned, the new federal Tax Hike Bill made the playing field even more uneven for New Jersey families and businesses. The Moocher States decided to push the full cost of the tax bill on states like our by gutting the SALT deduction. While the law hasn’t yet seen its first tax season, we’re already beginning to see the evidence. It’s time we reversed that. Home values in lower-tax regions have been rising faster than those in places that counted on the SALT deduction, like us, according to an analysis by Zillow . In ZIP Codes where a larger share of residents takes the deductions, home values grew nearly a percentage point slower in December than in ZIP Codes that rely the least on deductions. That is a major shift from November 2017, before the bill passed. New Jersey’s Department of the Treasury reported in January a 35% drop in income-tax revenue for December compared with the previous year, attributing the shortfall to changes in tax policy. That’s why I’m working on a plan with Republican Congressman Lee Zeldin from New York to stop double taxation and fully reinstate the SALT deduction -- without raising tax rates back up. I also spearheaded New Jersey’s charitable tax cut plan to allow our taxpayers to utilize the deduction that 33 other states – mostly red states – already use to save money. I discussed the plan with the Administration just last week, and I’m hopeful that it will ultimately save New Jersey taxpayers real dollars. At the state level, Senate President Sweeney and Chairman Sarlo helped pass that bill through and led the way when it comes to saving New Jersey taxpayers money. I’ll also keep working with every town, fire and police department and non-profits to claw back more grant dollars from the Moocher States, like we’ve been doing to help get everything from firetrucks to generators, because we need to get our return from Washington up even more. Speaking of that, second, we must also do everything we can to invest and fix our crumbling roads, bridges, tunnels, and public transportation, because you can’t have a first-rate economy with second-class infrastructure. For years now, the federal government has stuck it to us and taken care of our states, to benefit the Moochers, leaving behind a mess – we need to fight to bring more back. We have the seventh worst roads in the country. And of the 6,730 bridges in our state, twenty-five percent of them, are classified as functionally obsolete. Of those that are most heavily traveled, more than a third are here in Bergen County. Commuters who live in my district have one of the worst commutes in the state. That means that parents don’t get home to see their kids. It also impacts productivity when it takes two hours to go 15 miles. Given what we pay in taxes, more of the federal dollars going to infrastructure should be coming back here. One of our largest obstacles placed on New Jersey by Washington is that the Administration is doing its best to go back on its word to fund the Gateway Project that would fix this problem. I will continue to work in Congress to get the Gateway Project fully funded and built, and I will work with anyone to do it. I talked with the White House about it just last week, and will continue to apply pressure with my legislation, the “Get On Board to Fix the Tunnel Act.” The entire New Jersey congressional delegation, including both our Senators, are united to get this project moving. We also need a plan B if the Amtrak and NJ Transit tunnels go down – an accident that would cost our economy $100 million every day. How will people get from New Jersey to the island of New York. It’s an island. How will people get to work? I will be sitting with stakeholders in the coming weeks and months to find out what we will do. We are increasingly having trouble recruiting people and businesses to come to and stay in New Jersey because of our infrastructure. I hear it all the time from CEOs and from would-be constituents. Now, we can’t blame Washington entirely for the pain of that loss. There are plenty of obstacles of New Jersey’s own making that have amplified the problem. Our overall tax burden, between state and local and now highest corporate taxes in country are simply too high and need to come down. Businesses and people of sufficient means will keep leaving, forcing an even bigger hole to fill … and we will keep chasing our tail. We were number one in outmigration last year – that is people leaving the state. These short-term tax sugar highs will lead to long-term deficits. Families are moving to other states, because it’s saving them millions. And it’s costing us billions. Twice as many people moved out of New Jersey in 2018 as moved in. And the people moving into New Jersey have an income 50 percent lower than those leaving New Jersey, according to RegentAtlantic. Do you know what they call a New Jersey family in a moving van in Florida? “Tax Refugees.” While we have shrank, Florida has bloomed. They’re even advertising in our papers. Businesses are also leaving. Honeywell got $40 million in tax credits from our state, but, still, in November, decided to move its New Jersey headquarters to North Carolina. Mercedes-Benz USA moved its headquarters from Montvale to Georgia. Benjamin Moore and Hertz moved out of our District, too. From 2004 to 2013, New Jersey only netted 3,880 new businesses. Florida gained more than seven times that with 29,000. Even Pennsylvania gained four times more than we did with 16,000 during the same period. The CEO of DSM, USA, up in Belvidere, told me that their company declined to expand in New Jersey because it’s too expensive here. He literally knocked down a building, drew up plans to put up a new facility with scores of new jobs, and then pulled the plug after he looked at the total cost. Other states, including our neighboring states, are literally targeting and recruiting our companies. Companies like Johnson & Johnson and BD have told me the same. These larger companies affect dozens of mid-size and smaller businesses who rely on them, from suppliers to dry cleaners to delis. Here’s how we get them back and grow our businesses. We need a clear plan. I’ll just cover some of the broad strokes today – more details to come. New Jersey is already a hub for the life sciences – we need to double down on that – and do what we can to draw more and keep more of those jobs here, especially biotech. Several of the top medical device companies, utilizing the latest R&D, are headquartered here in my District, but when they add new jobs or facilities, they often do it elsewhere. Given on our proximity to New York City and superfast broadband, we should also work to grow our financial service sector, including fintech, and redouble our efforts to keep high-skilled manufacturing jobs. We also need to tap into new fields that are exploding like photonics that’s adding hundreds of jobs in Newton. We need to work hand-in-hand with the private sector, universities like this one, and community colleges, to develop programs that will make us more innovative, our workers more ready for the future, and our state better prepared for growth – growth that creates good-paying jobs and encourages people to build a good, affordable life here. We need skills that match the jobs of today and tomorrow, and that includes STEAM and skilled labor. We also need to actually incentive businesses to move to New Jersey and grow here, not just pay those to move around the state, and penalize them if they leave after taking our money. And we need to encourage more business incubators and accelerators to put up a flag in our District, so we can give our researchers and students space to build new products in collaboration with our incredible companies. By building neighborhoods that accommodate for life, work, and play together, we can do more to stop the massive outpouring of talent -- and attract more millennials. New Jersey is known as the “king of the suburbs,” but millennials want to walk to dinner and the movies and to the train, and are less interested in working in the traditional car-centered office parks. We need to look at developing hubs, business districts, and new housing around rails in our towns, so they are more walkable and transit friendly. We also need to build more reasonably-priced housing for professionals, because of our cost of housing is actually scaring off recruits. Finally, we need to cut taxes and unnecessary red tape that makes it impossible for businesses to actually start up and operate. And we need to rethink the way we approach laws like the Highlands Act, that end up unintentionally penalizing some of our struggling communities that otherwise have great potential. There's a balance, you can be supportive of business while still protecting people. Anyone who says you can't is selling a false choice. Now, I wish I had all day to cover every topic, but then I’d have to serve you dinner. I didn’t get a chance to fully praise all of the excellent work happening in all corners of my District – the nonprofits, the churches and synagogues, the students and seniors, and the veterans. But it’s happening, and it’s why I’m so confident that we will overcome the obstacles in our way -- those imposed on us, and those of our own making – and will ultimately succeed. The way we always have. I’m very proud to represent the Fifth Congressional District and to serve all of you, and I’m especially honored, with the help of my excellent team, to assist with any individual issues. My office has a dedicated team of caseworkers prepared to address a whole range of matters from Social Security and Medicare to visas and passports to student loans. They’ve helped me get home repairs done for a hard-working 85-year-old Sussex County resident and deliver lost service medals to World War II veterans. We treat everyone with respect, regardless of where you’re from, your station in life, or who you love or marry. After all, I’m blessed, like we all are, to live in the greatest country in the world. I’m confident that if we focus and work together, our best days will always be ahead of us. Thank you. God bless you. And God bless New Jersey’s Fifth District and the United States of America.